Sophos Secure Workspace is the place where you can access your company’s documents or corporate websites. All data is stored with AES-256 encryption, matching military grade requirements. 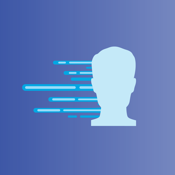 Sophos Secure Workspace is designed to prevent any data loss even when your device gets stolen or lost. Sophos Secure Workspace can be managed by Sophos Mobile Control, an Enterprise Mobility Management (EMM) solution. 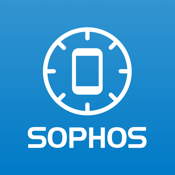 Sophos Secure Workspace runs inside the Sophos container and the Sophos Mobile Control administrator can impose security related settings. Sophos Secure Workspace is fully compatible with the Sophos SafeGuard Enterprise file and cloud encryption offering. Documents are secured using keys that only you know or that are provided to you by your company. • Manage all your files from various cloud storage providers. • Seamlessly access encrypted files using the keys from your keyring. 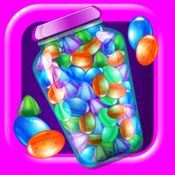 • Apply common file operations, like move or delete. 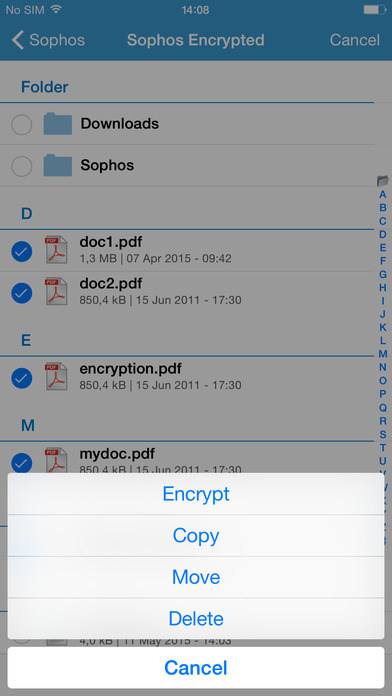 • Add and encrypt documents, or decrypt them. 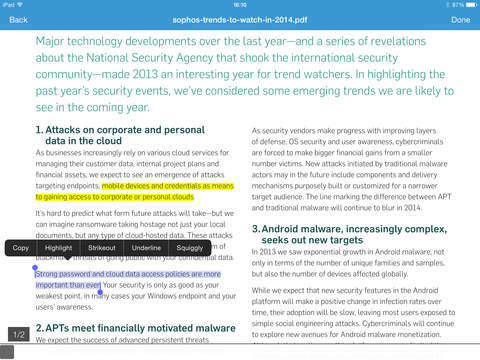 • Edit PDF or text files and view Microsoft Office documents. • Store files with AES-256 encryption. • Create local encryption keys or use the keys that are included in the accessed documents. • Protect app access with a passcode or your fingerprint. 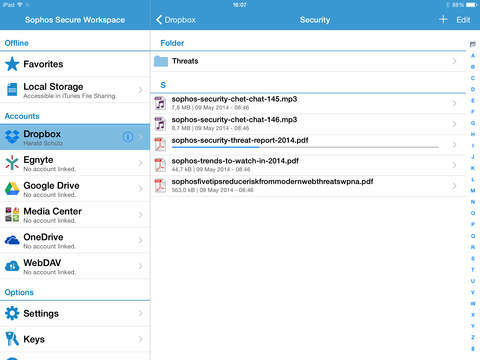 Sophos Secure Workspace can be managed by Sophos Mobile Control from a central management console. It then runs inside the Sophos container that enables the administrator to configure additional corporate and security related features. • Enforce an app password. • Auto-lock the app after being offline for a certain time. 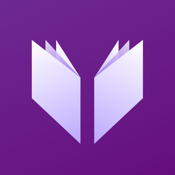 • Remotely lock the app in case of a security breach. • Restrict app access based on geo, time and Wi-Fi fencing. 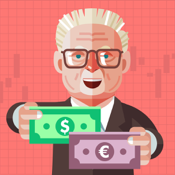 • Define allowed storage providers. 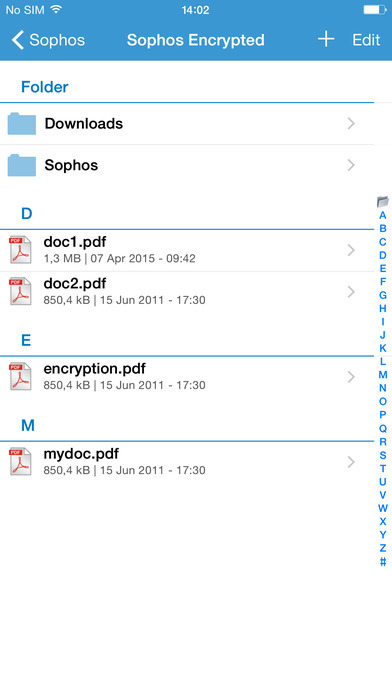 • Publish corporate documents on an Egnyte or WebDAV server or distribute them through Sophos Mobile Control. • Restrict file sharing by configuring DLP rules. 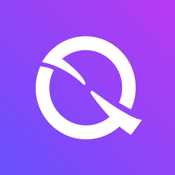 • Provide the Corporate Browser that enables users to securely access corporate websites and to store all browsing data and credentials in encrypted form. • Provide a corporate keyring to let users access their Sophos SafeGuard Enterprise keys, including their recovery keys for BitLocker and FileVault disk encryption. Sophos SafeGuard Enterprise is a leading data protection product, to provide seamless access to encrypted documents.